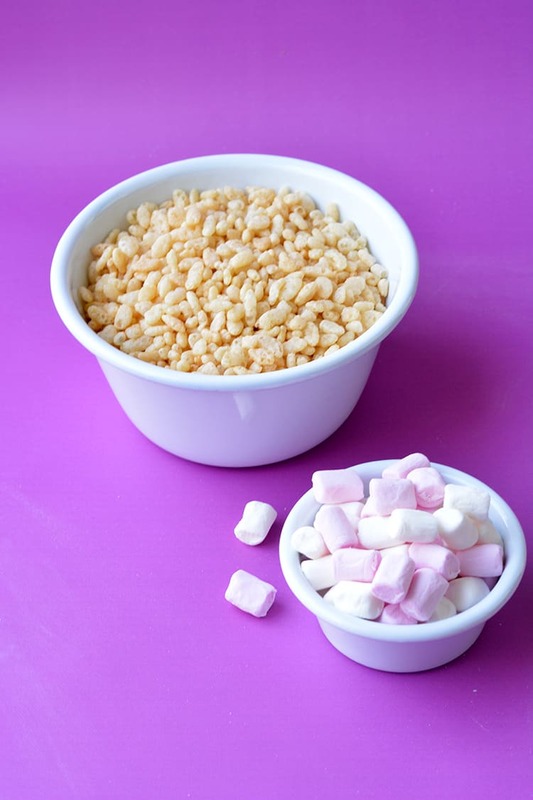 No bake White Chocolate Rice Krispie Squares made with just 5 ingredients. 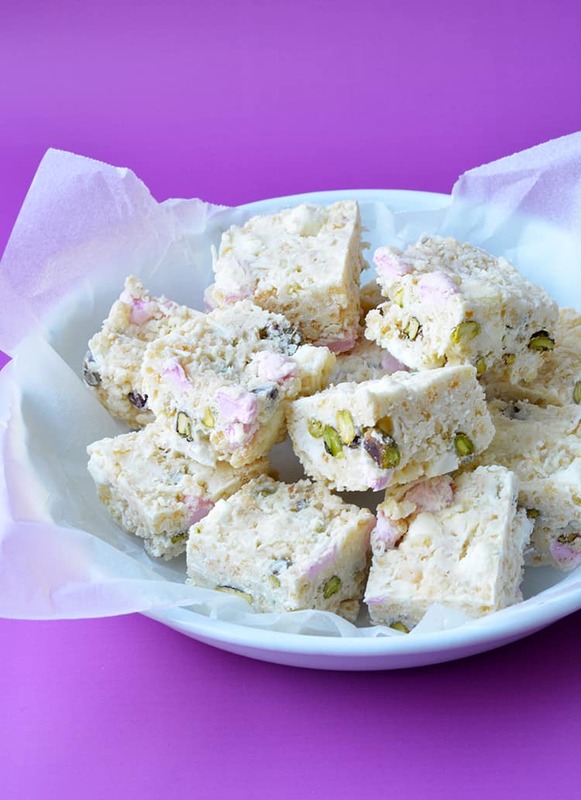 White chocolate, rice cereal and marshmallows combine to make a gorgeous chocolate slice, perfect for sharing. 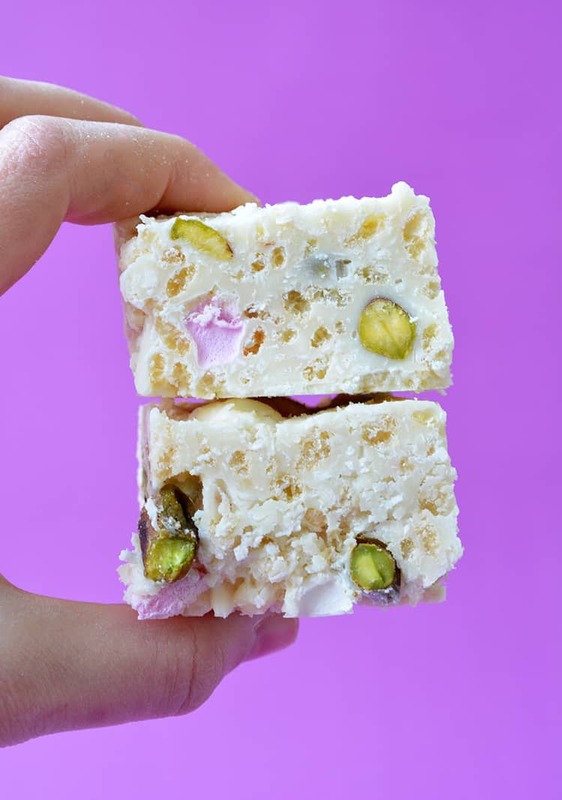 If white chocolate is your weakness and you have a thing for Rice Krispies, you are going to fall head over heels for this week’s recipe. 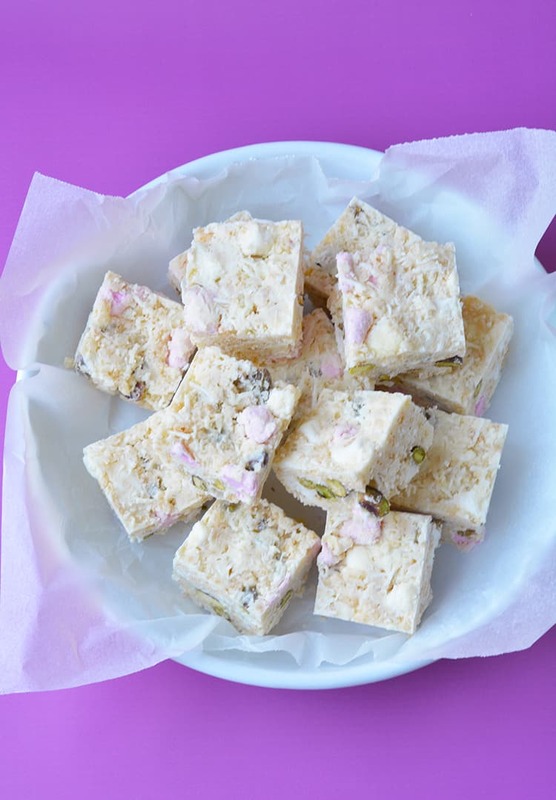 These easy 5 ingredient White Chocolate Rice Krispie Squares are for YOU. Are you familiar with the wonders of rice cereal in chocolate? I think it was roughly three years ago when I made my Candy Crunch Chocolate Bar and since then, I’ve been ALL about the Rice Krispies. We’ve made Peanut Butter Candy Crunch Pie with a crunchy Rice Krispie topping and Peanut Butter Rice Krispie Bars. But this 👇🏻 This is the first White Chocolate Rice Krispie treat. You only need 5 ingredients and 10 minutes to throw these Rice Krispie Squares together. YES throw together. This is literally a mix and stir recipe. One bowl, one spoon and you are DONE. Make sure you line your baking tin with baking paper and have it ready to go before you start making the bars. Once you add the melted white chocolate, you’ll need to act swiftly. 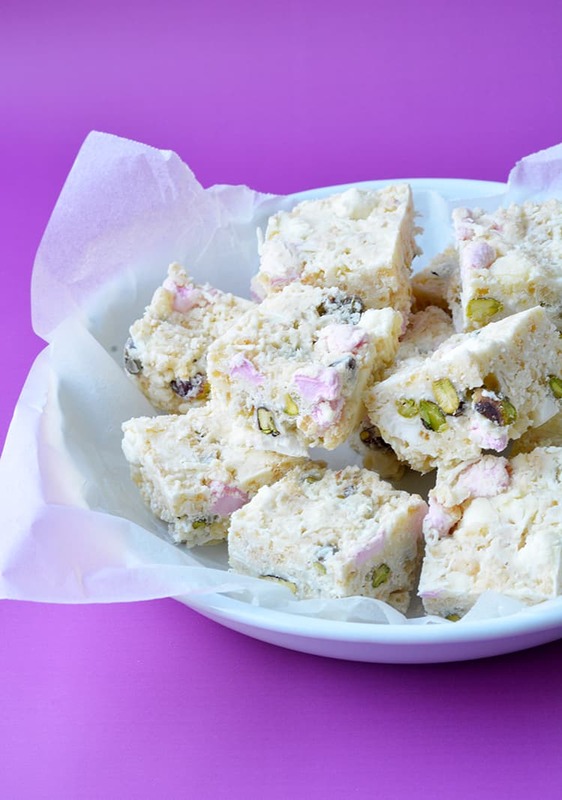 Choose good quality white chocolate for this recipe, it will make a big difference. You can use any nuts you like in these Rice Krispie bars. I love the flavour of pistachios but you could use peanuts or walnuts. To make them nut free, swap the pistachios for dried cranberries or chocolate chips. 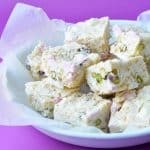 Easy no bake White Chocolate Rice Krispie Treats with marshmallows, coconut and pistachios. Grease and line an 8 inch square baking tin with baking or parchment paper. 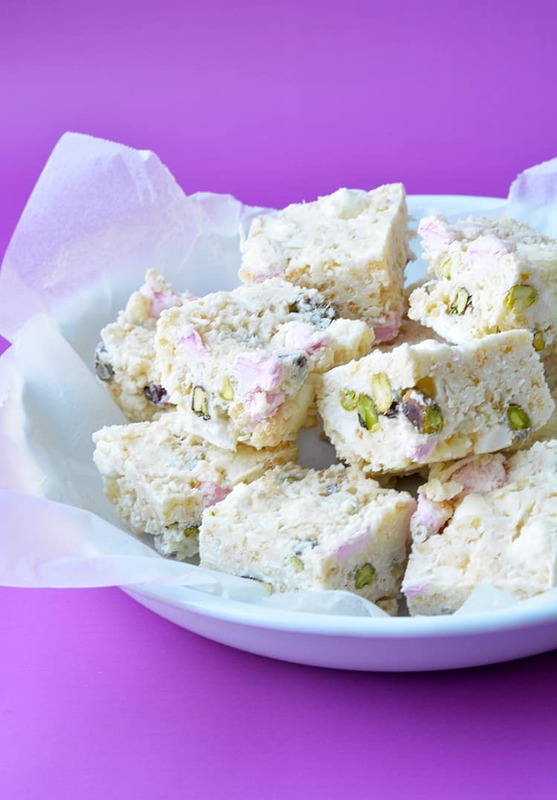 In a large mixing bowl, add rice cereal, coconut, pistachios and marshmallows. Heat chocolate in the microwave, stirring in-between 30 second bursts until just melted. Pour chocolate over dry ingredients. Quickly mix together until completely coated. Transfer to baking tin. Quickly spread out into one smooth layer and press down using the back of a spoon. Refrigerate for at least one hour or until the chocolate is set. Cut into small squares and serve. *You can use any nut you prefer, peanuts, almonds, pecans etc. YUM! These are just like White Christmas bars!